I have fond memories of eating muscadines and scuppernongs too. We have the black growing wild down here in FL, but they never get as large as the ones I loved in SC. 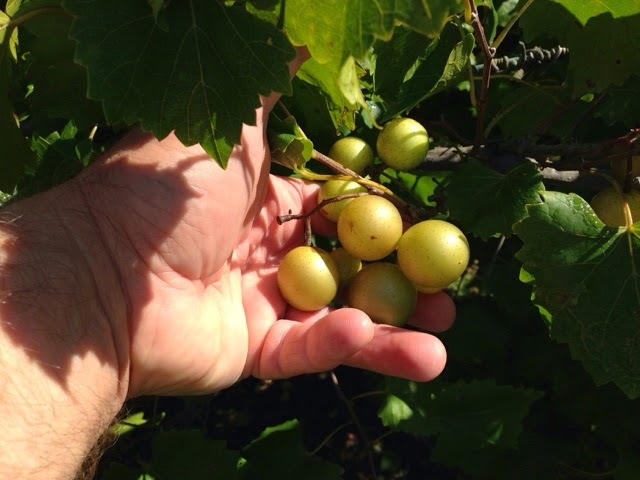 I haven't ever seen a scuppernong growing wild here, but I'm always tempted to toss some seeds out when I buy a package, although I know they won't come true from the hybrid varieties. Still, if they revert back to wild scuppernongs, would that be so bad? I finally have a yard again, and one of the first things I'm going to do is buy a muscadine and scuppernong vine to use as a fence between me and my crazy neighbors. There are so many children in this neighborhood, and I know they will steal the grapes, but who cares, really? Children shoudl be allowed to be children and do childish things. Great post, your passion for NC is really inspiring, I hope its fortunes can change soon.